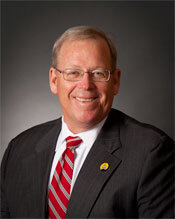 CARBONDALE, Ill. – Doug Whitley, who recently retired as president and CEO of the Illinois Chamber of Commerce, will discuss the policy agenda of the state’s business community at Southern Illinois University Carbondale. The luncheon is free but advance registration is required for meal considerations. The registration deadline for lunch is Tuesday, Sept. 30. To register, contact Carol Greenlee, institute project coordinator, at 618/453-4078 or by email at rsvp@paulsimoninstitute.org. Whitley retired from the Illinois Chamber in June but has since assumed a leadership role with the Supply Chain Innovation Network, or SINC, to help solve problems associated with the state’s transportation industries. He is a 1973 SIU Carbondale graduate with degrees in history and government. David Yepsen, institute director, said he believes a key component in the series is to hear different perspectives on ideas for improving the economy, particularly the struggles faced by middle-income Americans. Sarita Gupta, executive director of “Jobs With Justice,” was the inaugural speaker and also spoke on the nation’s income disparity and possibilities for narrowing the gap. A former president of Illinois Bell, later Ameritech Illinois, Whitley was Illinois Chamber of Commerce president for 13 years. He is co-founder of the Transportation for Illinois Coalition and used that to forum in advocating continued investment of public funds in the state’s infrastructure projects. He is co-chair of the Illinois Business Immigration Coalition and co-chair of the Finance Committee, appointed by the Illinois Toll Highway Authority. The committee advises the agency in regards to the future construction of a new toll highway in Lake County. More information on the Oct. 3 program is available at paulsimoninstitute.siu.edu.